I always look forward to the new We R Memory Keepers products every year! They are so fun and innovative and they tend to push the limits of the crafting world. This year is no different! They have some great new products, like Ruler Studio, Alphabet Punch boards, a Template Studio Bow, new colors of tote bags, and more. 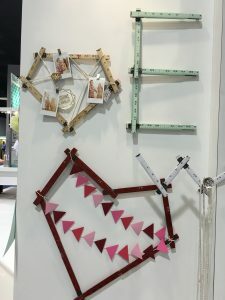 So let's look at some of these new products from the experts at We R.
Let me just say, this is my next home decor project I am doing! I have a whole wall that is not-so-patiently waiting for this product to arrive (should be the mid-end of February - you can pre-order now). Here is how Ruler Studio works: each package comes with 10 legs. Each of these legs can be bend to make various shapes. So if you look at the picture on the left you see stars and a triangle. To the right a heart, diamond and the letter E. You can just bend each section at the hinge. If you need more you can use the foam dots to add to the design! 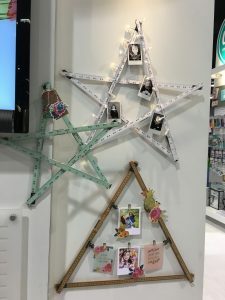 After you have it shaped to your liking, you can use lots of embellishments to decorate, such as clips for hanging up pictures, or if you created a frame there is natural string for a clothes line effect - and don't forget the lights! 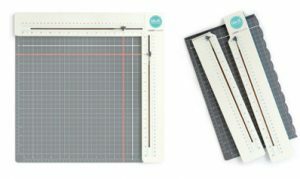 These fun DIY Rulers come in 3 lengths, 12", 9" and 6" and in a variety, including white, mint, red, and natural. Everything in this collection is available now for pre-order. Second, we have a new model to add to our collection of punch boards called the Alphabet Punch Board. It makes it easy for you to create banners, signs, bulletin boards, and more! The Alphabet Punch will be available from CraftDirect at the end of February, and as with all the other punch boards it will probably sell out quickly so act fast (we should be pre-ordering soon)! This punch board lets you cut out every letter of the alphabet, numbers from 0-9, and an exclamation mark! 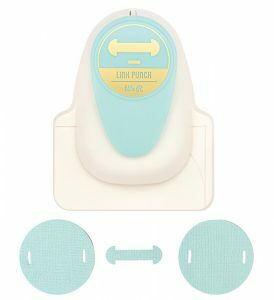 To go with this product, they are also releasing a Link Punch so you can easily turn your projects into a cute banner. Make all your We R paper into quick, fun works of craft art. We R totes are great, in case you don't know. 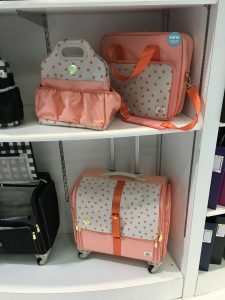 They have lots of space and features for smart storage of all your craft supplies, including paper, pens, washi tape, punch boards, and so much more. Their bags and totes are popular and come in a variety of colors and patterns, so no matter what your preferred style is, you can find a tote bag that's just right for you. 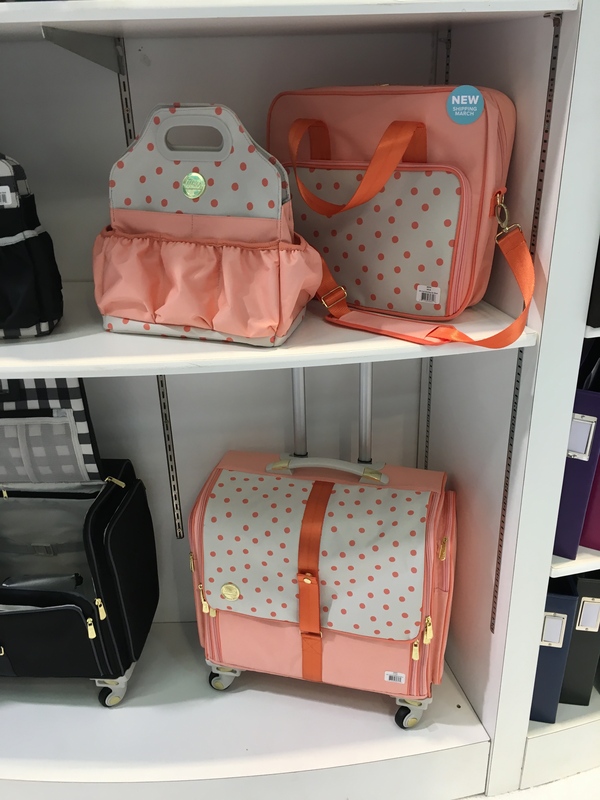 This year they have two new colors: a Blush Dot design (pictured on the right). It's a light peach and is very pretty! The other is a black and white plaid tote that is (pictured on the left). 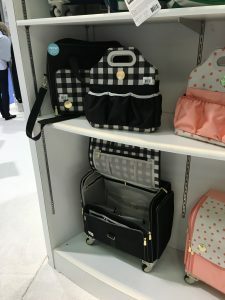 Both of these bags come in the Fold Up (360) type tote, the matching shoulder bag that is perfect for carrying your 12" x 12" paper, as well as the smaller tote bag that is great for embellishments, glue, scissors, and other knick-knacks. This bag is small enough that it will fit easily on your desk to help keep your space organized. These fun Animal Washi Tape dispensers hold 4 rolls of washi tape (they even come with 4 rolls of washi tape). They retail at $14.99 and they are just so cute! Right now they only have the Rhino and Scotty Dog (I hope they come out with more). Pre-order right now! When I first saw this staple board I didn't think much of it, but then I watched the rep demo. I totally changed my mind because of the convenience it offers. This set comes with three staplers, small, medium and large, as well as 250 staples, that are three different sizes and four different colors. The staple board also has a storage compartment, perfect for all your staples. With this staple board, you can staple anywhere on your paper, even in the center of a 12" x 12" sheet! I will use this to fix my kids books (that middle page comes out frequently and a normal stapler can't reach in the crease). Its great when you can use a product in the craft-room as well as around the home. The staple board retails for $19.99 and will be shipping in March. You can watch the demo on how this works here! Last, but not least, we have the Laser Square & Mat. If you are a scrapbooker like me, then you will need this tool! 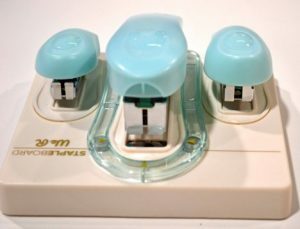 You can actually use it for a variety of craft projects, such as cards, stamps, quilting and just about any other type. This tool is in inches as well as centimeters, and goes from 0" to 12". This product has two lasers, one on the top and one on the side and both of them shoot a small laser beam to give you a straight line. When I saw this tool in action, the room was very bright and you could still see the laser. This tool comes with the mat and retails for $40.00 - will be available in March. I didn't go into detail about all the products coming out from We R Memory Keepers but I think I covered all the big ones! If I missed something you want to know about, leave me a comment and I will give you all the info I have. There are quite a few paper stacks that will be coming out this year, so keep an eye out for those. Some of them we get in for a very short time and then we are unable to get more in, so if you find something you love, you should definitely grab it while it's in stock. You never know, it may be gone for good. Next week I'm going to share with you all about the Cray-Pen, which we already have in stock. You won't want to miss out on this one!